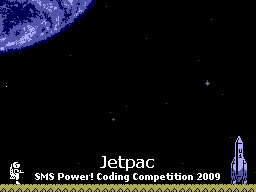 View topic - [Coding 2009] Jetpac by Grz- - Forums - SMS Power! How good is this entry? Not complete but a great start on a game. I hope you finish it off and leave time for next year's entry :) I'm not familiar with the original but I know it's a classic. The control scheme is smooth and pleasant, this is a rather good start. 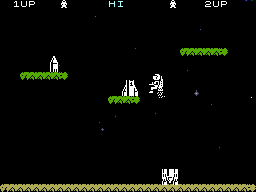 Yes, i started 6day ago from scratch, i don't had time to add more thing, also there is a platform collision bug that i couldn't get rid off. How come this one only goes up to 8? It was a bug, fixed. This is a very promising start. I really hope to see it finished.